Startup Scaleup is back and better than ever! We have revamped our agenda to include completely different panels, workshops, speakers and events. While the feel and the mission of the day remain the same – the content, people and experience will be different. To help you prepare, we’ve compiled a few helpful navigation tips to ensure smooth sailing amidst the hustle and bustle of event day. The event officially begins at 9 am—which is when our first session kicks off. We encourage attendees to arrive around 8 am to sign in and get their meal tickets and program before finding a seat at their first session. There are a variety of free parking options available in and around Gordon Square, including four parking lots (these will fill up fast) and plenty of street parking. In addition, valet service will be available in front of the Capitol Theatre on a first come/first serve basis for an additional fee. We also encourage carpooling and ridesharing (Lyft or Uber). 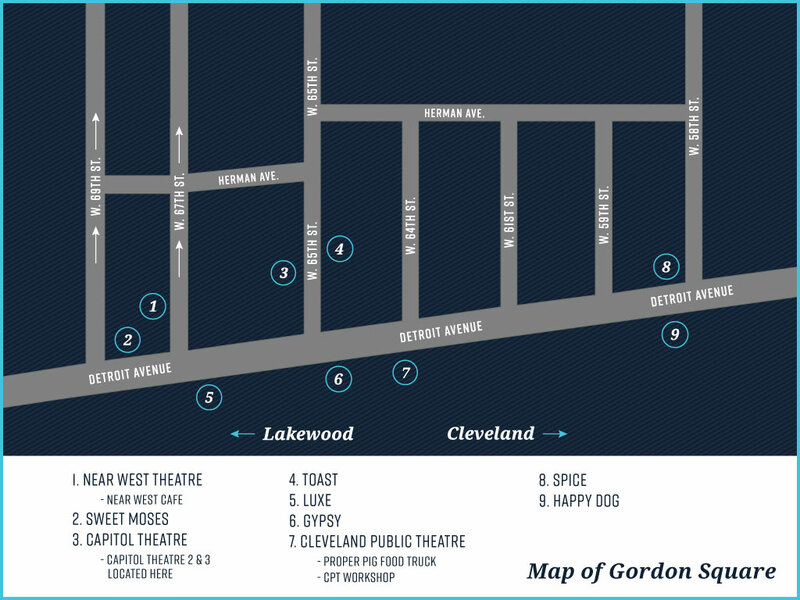 If you’re being dropped off, the Near West Theater will be a great option given its central location within Gordon Square. This is also where registration will take place. Onsite registration will be at the Near West Theatre located at 6702 Detroit Ave. There will be plenty of directional signs near the Arcade to direct everyone on foot. Even if you register online prior to the event, you must sign in at the Near West Theatre to receive your program of events and your food and drink vouchers for the day. We’ve built a handy Startup Scaleup app to make your event experience even better this year! With the app, you’ll be able to connect and engage with other attendees, plan your day by favoriting sessions and speakers, easily navigate the event with help from an in-app map and receive push notifications throughout the day regarding important event details and reminders for your favorited sessions. The first events of the day will begin at 9am. Sessions will run continuously throughout the day until 4:30pm, with short breaks in between that allow time for you to grab a snack or lunch and network with other attendees. We do want to note that some of our more popular sessions will fill up quickly (including sessions led by prominent speakers and those around the topic of funding), and while we want to accommodate everyone, sometimes there just isn’t room. If there is a session you really don’t want to miss, we encourage you to get there early to secure a seat. With your Startup Scaleup registration, you will receive $20 in the form of meal tickets redeemable at participating restaurants in the Gordon Square Arts District. We will be releasing menus for these locations soon, so stay tuned! Official Startup Scaleup programming ends at 4:30 pm. but we’d love for you to stay for our partner events, which go until approximately 8 p.m.
Join TechPint at Happy Dog to grab a free beer and enjoy live music from 80HD, a local band featuring local entrepreneur Steve McHale. Or head to Luxe for the Startup Scaleup Afterparty presented by Hue Enterprise and Word of Mouth. Enjoy an evening of conversation, networking and cocktails—plus music by DJ RED-I. On event day, JumpStart staff members—in navy blue t-shirts with the Startup Scaleup logo—will be available throughout Gordon Square to answer your questions and point you in the right direction. If you have questions prior to the event, please email [email protected] and a member of our team will be in touch.